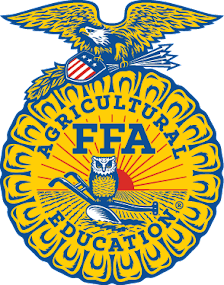 The Indiana FFA has been blessed to have thirty-seven Indiana FFA State Officer Candidates for the 2014-2015 Indiana FFA State Officer Team. Within this group, there is great potential for the Indiana FFA Organization to mold into our next leaders. Until then, these individuals have a great journey to be enjoyed. 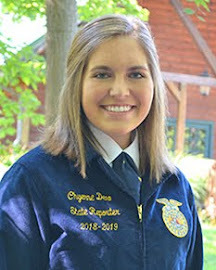 This past weekend many of the candidates joined together at the Indiana FFA Leadership Center to help with our Spring CDEs: Floriculture, Small Engines, and Practical Forestry, view an Executive Committee Meeting, convene for the State Officer Candidate Open House, and get to know one another. Their journey will most importantly be marked by the time they spend together and the relationships they build. Their journey is arduous, but it can be rewarding. As a candidate last year, I pray for each of these candidates. I pray that they all find a “heart to serve” and a “mind to work”. I pray they build lifelong relationships and find immense personal growth throughout the process. My biggest wish is that these candidates have fun. 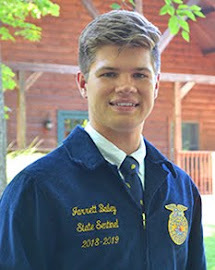 I have gotten to know many of the thirty-seven in my time in FFA. They are talented, have huge hearts, and bright personalities. I feel close to them and love them all dearly. I wish each of them the best, not in becoming a state officer, but in life. 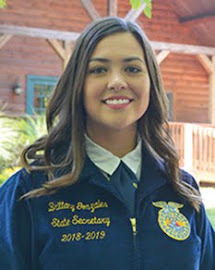 These candidates all represent how the FFA can develop individuals. For seven, it will be a continued process to grow and serve, but for all thirty-seven, it will be a process that will continually serve them in their future endeavors. With 63 days, five hours, 59 minutes, and eight seconds left on our "Time Left to Impact FFA" clock, it's safe to say that time has flown by way too fast. This morning us girls were packing to go home for the weekend, but as we packed I started to noticed that we are slowly starting to move our extra clothes back home. For me I'm not sure how to react, but for Kayla she is in complete denial. She told me that I shouldn't worry because when we come back on Monday she will have clothes to fill the empty areas in our closet. Over the course of this year my teammates and I have had such a blast. My teammates are some of the greatest people I know. I would just like to take a moment to thank each one of them. 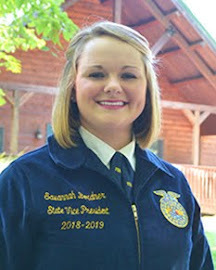 Allie, we have had some great talks while traveling to chapter visits and FFA events. I'm so glad to have someone to have deep conversations with about life and faith. Thank you for always being so positive you definitely knows how to brighten someone's day. 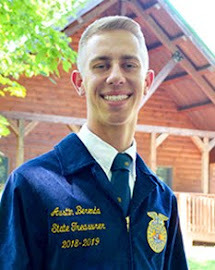 You are a great friend and role model to many FFA members across the state of Indiana. Kayla, I admire you for your drive and your ability to focus, because even as I write this my mind is running in a million directions. I never knew one of my best friends would live in the opposite corner of Indiana. Thank you for running with me and sharing my love for softball, even though we haven't really played much this year. I can't wait to come down to Posey county and learn how to shoot a gun, ride a four wheeler and do whatever else I miss out on up north. Ethan, even though you and I are completely polar opposites I could have never asked for a better southern region vice president. I know I can always count on you for great fashion advice. You are also a very talented volleyball player and have made me enjoy volleyball again. 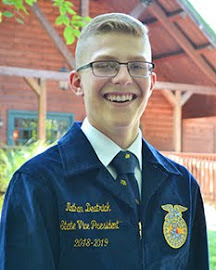 You are going to be a great agricultural lobbyist one day. 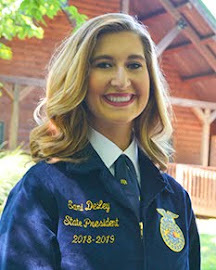 Shelby, your love for America, Ted, soil judging and FFA is very evident. On our trip to D.C. I had the opportunity to get to know you even better. I noticed your fear of pigeons is definitely real! You are a blessing to this team always willing to get the job done when maybe no one else wants to. And you always know how to have fun! Sarah, your dedication to your faith is something I have always looked up to. I'm so happy that I have someone who shares the same love for dance as I do. You are a great leader and I know you will be successful in whatever oath you decide to take. Cameron, you have definitely been the prankster of the house. And you have a great taste and many different genres of music. You know how to have a great time. Thank you for always being positive and always being bursting with energy. Just remember Cam you are sent from heaven:) haha. Thank you all so much for a great year and have a wonderful weekend home! Thank you all so much. I can't wait to see what the 63 next days hold for us! Rebekah, Bekah, or to Cameron...., BECKY!!!!! !